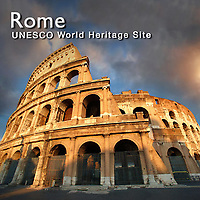 Pictures of the historic center of Rome Unesco World Heritage Site Italy. Photos & Images of the Colosseum and historic sites. See & buy Rome stock photos or Rome photo art prints & cards. Founded, according to legend, by Romulus and Remus in 753 BC, Rome was first the centre of the Roman Republic, then of the Roman Empire, and it became the capital of the Christian world in the 4th century. The World Heritage site, extended in 1990 to the walls of Urban VIII, includes some of the major monuments of antiquity such as the Forums, the Mausoleum of Augustus, the Mausoleum of Hadrian, the Pantheon, Trajan's Column and the Column of Marcus Aurelius, as well as the religious and public buildings of papal Rome.